This is a story of ups and downs, obstacles and fast tracks, creation and destruction. A few weeks back I have blogged about my interest in pattern drafting software and a little about pattern drafting methods, particularly Il Modellismo- Italian style. I also talked about numerous options of using CAD software in place of traditional pencil and paper combo. 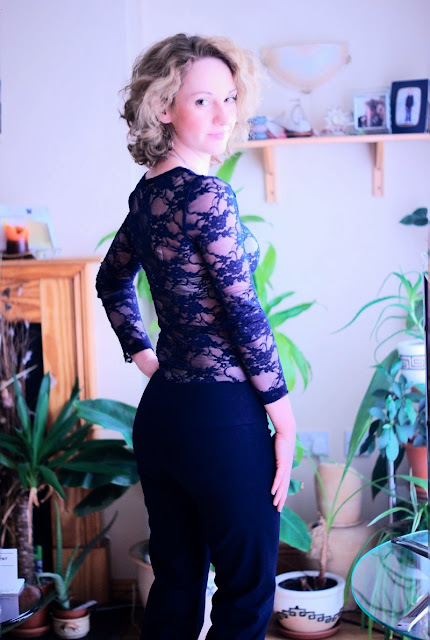 My drafting journey started with drafting a pattern of a simple pencil skirt, which is the easiest of all garments, and it was indeed very easy- after the muslin was done, it fit perfectly, but I decided to leave using the pattern for the future project as there was no need for another skirt for me at the time. 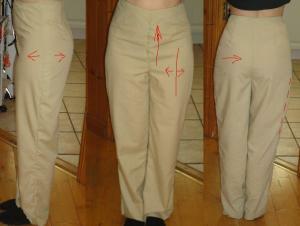 So I moved on to the more challenging part- drafting trousers. 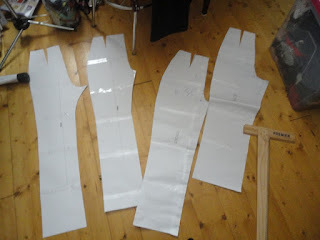 The most valuable lesson I learned is that pattern drafting is not the perfect solution for great looking garments. It is a hard enough process of trials and failings, frustrating at times. And although it is very rewarding when the best result is achieved, it does take serious commitment, and can be exhausting too. The main reason is quite obvious- every human's body is unique and it requires taking all measurements meticulously and accounting for every bump and curve when drafting: the depth and width of darts, for instance cannot really be predicted by a formula if the body shape is very different from standard. I, for instance, never even suspected that I do have a protruding tummy until I had to deal with designing the crotch. And that made an impact on the width of the darts in the front too - using the suggested instructions simply didn't work. Overall, my journey consisted of around 10 drafts. I used my CAD program for drafting, but I resorted on the old pencil to mark the needed adjustments on the current draft. I then transferred the adjustments onto the virtual draft and printed it again. One could argue that all this printing out A4, sticking it together and cutting out business is a waste of time, you could draft everything on paper in half the time. Yes, I agree, but to start with I have no paper large enough for drafting, and secondly I learned a little trick how to compile A4's into a pattern sheet in a very little time, I will post a tutorial a tutorial on this sometime soon. So it was good enough for me. My first sloper was very loose, I was looking for something much more contemporary looking than that, so I tried to create something more tight, which resulted in the following, quite strange looking sloper. I called it: "a message to J-Lo". Impressive waist-hips ratio, huh? And there it is- my protruding tum too. However I stopped posting photos after the second one as I was getting to understand the basics and looking at other people's slopers too. I took pictures and was able to analyse them myself too. One very important tip I took on board is pinning technique. Basically you wear the garment( sloper) inside out and pin it into the best possible fit. There is a great series of books I found out about called "for real people" - where this method is wisely applied. And it is about commercial patterns too. I got my hands on Pants for Real People , that a friend of mine was able to lend me for a bit, and I am sure it made a massive difference to my project. One draft after the other, the better fit was achieved and the mistakes (mostly) eliminated (I hope). So when the sloper looked very acceptable, it was the time to put it all to work for real! And here they are- my perfect pants. Yes, I am not afraid of the "P" word- according to my husband, they are the best pair I have ever owned, and I value his opinion a lot. I lowered the waist line quite a bit and added a wide yoke, just above the hips to try and not look like J-lo in the bum department as little as possible. The wide yoke really makes a difference- I believe it looks very flattering. There are a few elements I would love to expand on, for example the zipper insertion technique, but I think I will keep it for another post, and as I am planning to use this pattern in future, the photo tutorial mightbe a better idea. I used just over 1.20m of Stretch Gabardine Manci bought at myfabrics.co.uk - my favourite fabric site for online shopping. The yoke is faced by simple polyester lining, which I cut along the grain- great tip for those cheap lining fabrics that break easily along the seams in no time. It worked well- I had no issues with my seams this time. The front features 4 shank navy buttons with silver braiding, however, they are only decoration as I used snaps underneath instead. I don't like the buttonholes my sewing machine produces, so I wanted to find an alternative and it worked! Overall the weeks spent sweating over the pants patterns paid off, I have a great one to use for most my future tight pants- perfect fit guaranteed! I just need to come up with a good name for it! всё очень красиво обработанно и тебе идёт безусловно и форма и цвет! Ноги от ушей! линия бедра очень красивая. ну а самое интерессное для меня лично где:-)? где вид со спины? Your pants make me want to sew pants again... though I´ll wait till the fall. The fitting is impecable! You did a great job, and discovered so many inportant things. Thanks for sharing them! You've done a beautiful job, your pants are fabulous. Getting a good fitting sloper really is worth all the trouble! I've really enjoyed drafting my own slopers and then patterns, but I've noticed from other people that you really have to be spot on with your measurements and in the lines you draw because it makes such a difference! For myself I know that when a sloper tells me to add shaping in for somewhere like the hip I know to do very little because I always end up taking it out at the toile stage. Pinning your toile and then transferring the changes onto your pattern are always are god thing to do! Absolutely gorgeous! I can't get over how fab these pants are! I wonder what drawing tool you have used for this? It's clear you spent a lot of work on getting these pants to fit so perfectly, but wow it was worth it. Wow! Great outcome... they really look great! What a classy pants! They are perfect indeed and flatter your figure ;) Last winter we were learning how to use CAD on my pattern-making classes for about a month, and I was super enthusiastic about getting it for myself. Nevertheless, it only exists as a PCs and not Mac version. Such a disappointment! As much as I don't like PCs I might invest in a cheap laptop one day just to use this software. These are gorgeous and fit you wonderfully! Oh my gosh! These trousers look amazing on you! What a flattering fit! Great job!! Your pants look great. All the hard work paid off!